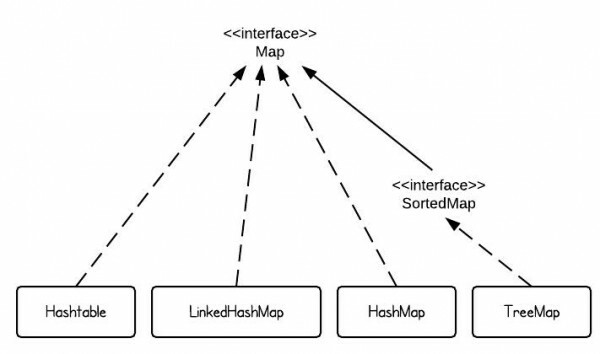 LinkedHashMap preserves the insertion order. Note here, we add “white dogs” twice by mistake, but the HashMap accepts it. This does not make sense, because now we are confused with how many white dogs are really there. The reason is that HashMap doesn’t allow two identical elements. By default, the hashCode() and equals() methods implemented in the Object class are used. The default hashCode() method gives distinct integers for distinct objects, and the equals() method only returns true when two references refer to the same object. A TreeMap is sorted by keys. Let’s first take a look at the following example to understand the “sorted by keys” idea. Since TreeMaps are sorted by keys, the object for key has to be able to compare with each other, that’s why it has to implement Comparable interface. For example, you use String as key, because String implements Comparable interface. Let’s change the Dog, and make it comparable. From Java Doc: The HashMap class is roughly equivalent to Hashtable, except that it is unsynchronized and permits nulls. The difference is that if we use HashMap the output could be the following – the insertion order is not preserved.